The Black Mamba is the most deadly snake in the world. They grow 14 feet in length, and can travel at speeds of up to 12 mph. They have a head shaped like a coffin. The Black Mamba is not actually black. 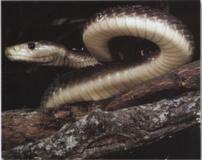 They have a brownish-gray body with a light belly and brownish scales along its back. It gets its name from the color of the lining of its mouth, which is purple-black, and which it displays when threatened. "Black Mamba", Wildlife Explorer, USA: International Masters Publishers. 1999.